blue wrote: I'm thinking now, that instead, when I added subsets into the mix, it caused a lot of naked pairs to appear in the intermediate ("T-quiescent") states. I think it's usually a bad idea to choose a "guess" cell in a naked pair, when other bi-value cells are available. As i said, i would prefer to test bilocation candidates instead of bivalue candidates. Now i should add: bilocation candidates which are not pairs (i guess that always one exists). The more candidates the 2 cells have, the better. E.g. 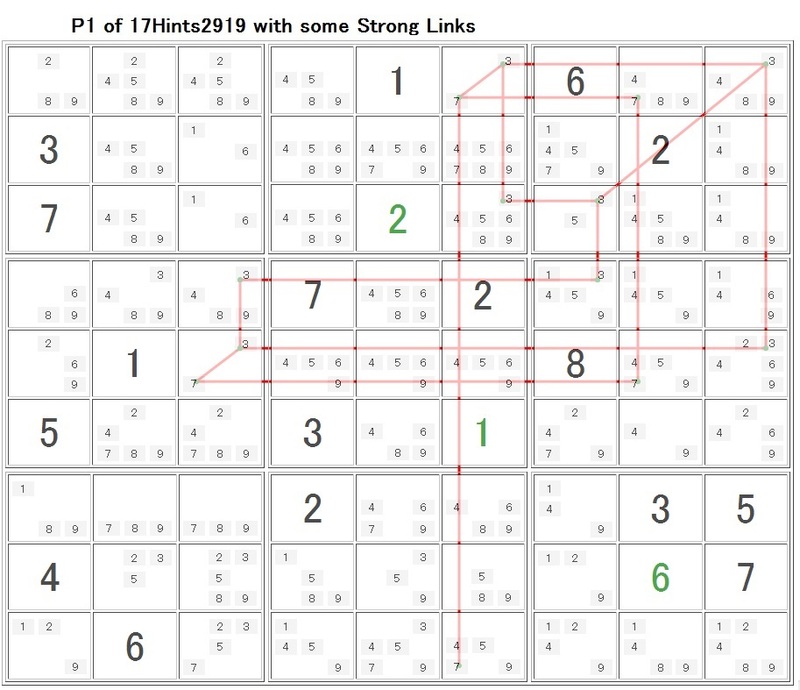 in 17Hints2919 i tried the strong link for 7 in r1 and it quickly finished. eleven wrote: As i said, i would prefer to test bilocation candidates instead of bivalue candidates. Now i should add: bilocation candidates which are not pairs (i guess that always one exists). I've been curious about how that would work too. Bi-local candidates that are part of a played out X-Wing, are probably not good either. blue wrote: Bi-local candidates that are part of a played out X-Wing, are probably not good either. Funny, i just wanted to add this. tknottet wrote: I had forgotten important thing. My rating assume that R(Pxy)=R(Pyx).If R(Pxy) is already calculated, R(Pyx) is not calculated. R(Pxy) is used in place of R(yx). blue wrote: I can try producing actual resolution paths too, and see how that works -- like the "1,000,000" paths I was using in my "bug hunt" (only fewer !). I used something similar to that last idea of yours, and for the high rated puzzles I ran out of RAM, long before running out of patience. Without that, the times would have been too long for me, even before switching to "completely random T&E". I did get exact ratings for all but one of the puzzles that were showing the largest increase in ratings, as more solving techiniques were added. For the rest, I used the "Monte Carlo" method to estimate them -- with 100,000 (random) resolution paths per puzzle. The results are below, with the +/- error estimates ("95% confidence intervals") in  brackets. The entries with "[ ---- ]" for the error estimates, are exact. Your conjecture was right ... the ratings do decrease now, as more techniques are added. They're also much larger than before ... which was to be expected. [ A warning: The table has 48*4 = 192 entries, with "95% confidence" intervals listed. That really does mean that 5%, or around 10 of the values are expected to be off by more than amount estimated. I'm sory, I made a mistake again. tknottet wrote: Then the next problem. I cannot think that rule15 have this bad property. the on-on-vector chains) is eliminated by tracing the on-on-vector reversely. (B)If a candidate in the on-on-vector chains is asserted, the end candidate is asserted, then the other end candidate is eliminated, then the focused candidate is eliminated. blue and eleven, your discussion is interesting. eleven wrote: The more candidates the 2 cells have, the better. I uploaded an illustration of first P1 of 17Hints2919 with some strong-links. I found a very large strong-link network including some candidates in r1. Do you mean choosing a "guess" cell from "candidates(means adjacent pair for each network) in the maximum strong-link network(s)"? It will help me to decrease computing time for rating. blue,thank you very much for your report. It pleased me very much. blue wrote: I think it's usually a bad idea to choose a "guess" cell in a naked pair, when other bi-value cells are available. When you observe the resolution paths of hard puzzles, you can see that Singles are interspersed among long streaks of whip/braid eliminations. It means that, in such puzzles, T&E eliminations rarely occur in bivalue/bilocal cells (where it would be followed by a Single) and the strategy consisting of assigning higher priority to test candidates in such cells is a bad one. However, I have no data that could lead me to say that it can be still worse to choose them from (Naked, Hidden or SuperHidden) Pairs. I can imagine that an elimination in a Pair doesn't lead very far in general, because a Pair is a very local pattern. But do you have any stronger evidence? All this leaves open the question of the best strategy for T&E. Until now, I've always used a purely random choice among all the remaining candidates. It's interesting if your analyses lead to a better choice. eleven, I don't understand your last sentence above: are you suggesting that the opposite strategy (choosing from cells with the largest number of candidates) is better (when dealing with bilocal candidates)? Also, do you have any reason to make a difference between bivalue and bilocal candidates. blue wrote: the ratings do decrease now, as more techniques are added. The ratings do decrease when rules are added, BUT not by orders of magnitude, except in rare cases. They probably don't decrease enough to counterbalance (in the mean) the increase in computation times. Do you have any data about it? blue wrote: They're also much larger than before ... which was to be expected. What's remarkable also in your table is the very narrow confidence intervals for all the puzzles (I understand the numbers in square brackets as the half-lengths). It makes it all the more interesting to have the min and max values. tknottet wrote: blue and eleven, your discussion is interesting. This is not what eleven said, but my new proposal. denis_berthier wrote: All this leaves open the question of the best strategy for T&E. Until now, I've always used a purely random choice among all the remaining candidates. It's interesting if your analyses lead to a better choice. The "best" choice for T&E depends on your criteria for "best". In brute force solvers the important criteria is ruling out as much of the search space as possible with each guess. Choosing a candidate in a bivalve cell gives you good odds of eliminating half of the search with only a little work. Choosing a bilocation candidate with many other candidates in the same cells likewise gives you good odds for eliminating several candidates at once with little work, which also narrows the search space more quickly than a truly random candidate choice. The fastest brute force solvers all currently use bivalve cells. Bivalve cells are easy to spot and narrow the search space quickly. Bilocation appears to have a potential speed advantage due to the possibility of more rapid narrowing of the search space. However, no one has published a solver with a quick enough way to locate an appropriate pair of bilocation candidates. For the moment, the extra search overhead appears to out weigh the potential search space narrowing advantage. However, that might just be a historical artifact. It isn't clear if bilocation has had enough investigation to reveal it's true potential. JasonLion wrote: The fastest brute force solvers all currently use bivalve cells. It isn't clear if bilocation has had enough investigation to reveal it's true potential. Has there been any comparison with solvers that use all the candidates, with no preference? Yes, we tried that. Picking a candidate at (semi) random is much worse in terms of total time/steps to solve. This makes intuitive sense. A randomly selected candidate has roughly a 1/3 chance of being true (actually I believe it is a little less than that). If you eliminate it as a possibility you have only eliminated 1/3 of the search space from consideration. In a bivalve cell each candidate has a 1/2 chance of being true, so an eliminated candidate cuts off 1/2 of the search space. I never tried to prove it, but the empirical results were very clear. JasonLion wrote: Yes, we tried that. Picking a candidate at (semi) random is much worse in terms of total time/steps to solve. This makes intuitive sense. A randomly selected candidate has roughly a 1/3 chance of being true (actually I believe it is a little less than that). If you eliminate it as a possibility you have only eliminated 1/3 of the search space from consideration. In a bivalve cell each candidate has a 1/2 chance of being true, so an eliminated candidate cuts off 1/2 of the search space. I never tried to prove it, but the empirical results were very clear. OK for the empirical results (considering that they are highly implementation-dependent, e.g. wrt the bivalue/bilocal difference). Has there been any study of how the empirical results depend on the SER of the puzzles? I don't have any records of the break downs by puzzle type for that particular optimization. I remember thinking of it as a big improvement across the board, but that is both an old memory and fairly vague. denis_berthier wrote: The ratings do decrease when rules are added, BUT not by orders of magnitude, except in rare cases. They probably don't decrease enough to counterbalance (in the mean) the increase in computation times. Do you have any data about it? That's the way it is for my code -- times doubled with locked candiates and subsets -vs- with singles only. For the method that tknottet asked me to use, whenever a guess was required, the code was to choose a random cell and a random candidate order for the cell, and try each candidate until one of them (if ever) produced a solution. That would mean that if the initial puzzle state is inconsistent, then all candidates in the cell are tried, and if the initial state is solvable, then (on average) half of them are tried. There's also a compounding effect, If during that process, additional levels of guessing are required. JasonLion wrote: However, no one has published a solver with a quick enough way to locate an appropriate pair of bilocation candidates. For the moment, the extra search overhead appears to out weigh the potential search space narrowing advantage. However, that might just be a historical artifact. It isn't clear if bilocation has had enough investigation to reveal it's true potential. You might experiment with fsss2, look at fsss2::findBiPositionDigit(int& digit, int& cell) at the bottom of fsss2.cpp file. I learned from Brian Turner's solver that choosing the topmost bivalue cell for T&E works measurable (~ 5 - 15%) slower than choosing pseudo-random bivalue cell. My personal preference for universal and most natural rating system is a deterministic estimation of T&E work after singles - something close to suexrat and to proposed by tknottet method but with T limited to singles. That is based on my assumption that all solving methods beyond singles are more or less hidden forms of T&E.